Jagan Institute of Management Studies has been highly successful in organizing IT Symposium on emerging technologies for the last 14 years. The focus is on proven technologies that have matured beyond the R&D stage, having wider applications and being commercialized especially to the advantage of the Indian Industry and society at large. This unique effort endeavours to act as a catalyst for technologies that will have a big impact on the overall economy of the country, increase productivity levels, speed of operation and also result in posting India high on the world technology levels. With this view, the symposium is designed to be a meeting point for policy makers, researchers, technology providers, end users, financers and knowledge seekers, associated with the technologies covered. 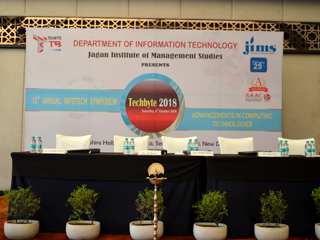 In the 15th Edition of Techbyte, organized on 6th October 2018, we witnessed a wide range of technological speeches, presentations and discussions. 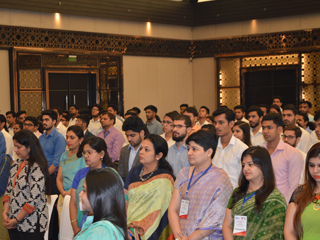 This year audience included all batches of MCA students, Faculty members from JIMS, Jamia Hamdard University, USICT, GTBIT, Delhi University and many other institutes of Delhi. Symposium started with inaugural ceremony at 9.30 am with Col Inderjeet Singh as Chief Guest, Mr Amit Jain as guest of honour, Dr Pooja Jain, Dr J K Goyal and Dr Praveen Arora gracing the dais with their presence. Session started with auspicious lamp lighting ceremony followed by welcome address of Dr Praveen Arora, Dean IPU Affiliated programs. 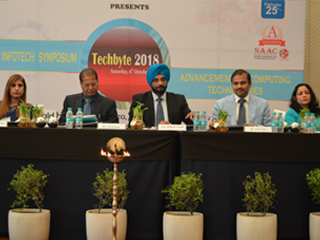 Dr Arora highlighted the cutting edge technologies on which IT industry is working these days and discussed about the requirements of highly skilled technocrats. Dr Pooja Jain, Director JIMS, in her Director’s Address focused on importance of technology in our life, and how technological tools and intelligent software are used to affect a consumers mind. Dr J K Goyal, Advisor JIMS, in his address emphasized on the use of modern technology even at the academic levels. 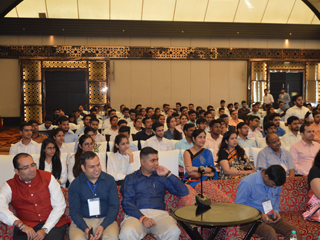 Chief Guest of the session, Col Inderjeet Singh, Chief cyber Security Expert at Vara United Ltd, encouraged students to learn new technologies like machine learning, data analytics and artificial intelligence and develop skill set rather than seeking jobs in IT industry. The guest of honour of the session Mr Amit Jain, partner at Foresight Group International, focussed his address on sharing his experiences in industry and encouraged students to focus on right functional skills for a successful career. 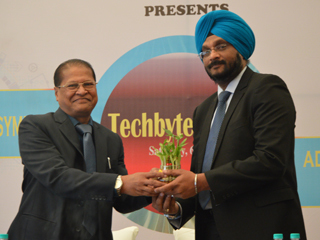 Inaugural session also witnessed the release of annual IT magazine ‘INSIGHT’ and concluded with a formal vote of thanks. 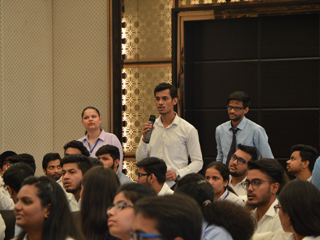 First technical session witnessed more technical discussions and brain storming as it opened with a speech of Ms Sheelam Gupta, Senior Manager Saxo Bank. She explained the concept of Agile methodology for software development. She demonstrated the efficiency of Agile by involving teams of student volunteers and assigning them some specific tasks. She also explained use of scrum framework in modern software development. Second speaker of Session Mr Sidharth Gandhi, Technical Cloud architect at TCS, started with an open discussion on cloud and its benefits. He further demonstrated the steps of using cloud services of AWS and gave full description of how these services can be used. Third Speaker of the session Mr Deepak Sar, Director Sales at Oracle India, started with a very positive note to concentrate on “HOW” and “WHY“ instead of “WHAT” and “WHEN”. He highlighted the journey of mankind and technology and importance of keeping up with the pace. He explained the importance of digital transformation and how it is to be perceived. In the post lunch proceedings, second technical session started with a speech of Mr Vinod Kumar Vaish, deputy manager at Planetcast Software. He explained the use of blockchain technology to the audience. He discussed about start and sue of block chain in bit coins, crypto-currency and many other areas. Dr Mani Madhukar, Program Manager -University Alliances IBM, made the session more attractive by involving students in live examples. He explained the role of blockchain in solving critical problems and explained the concept using application areas. Symposium was highly interactive and provided a knowledge sharing platform. Students interacted with guest speakers about various issues and were very happy on being part of this knowledge journey. Symposium closed with a formal vote of thanks followed by National Anthem.